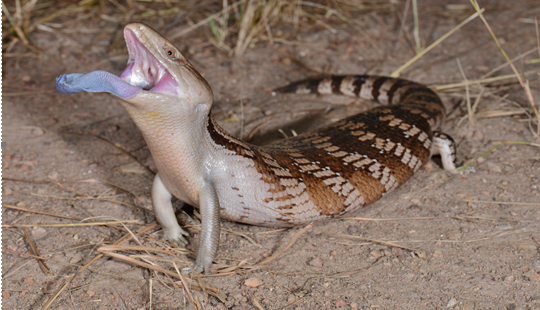 Bluetongue lizards use their tongues as a last-ditch effort to avoid being eaten, according to the latest research from the Lizard Lab at Macquarie University in Sydney. The base of their tongue is particularly bright under UV light – which birds can see clearly. The lizard relies on camouflage to avoid hawks and other predators. When that fails, the lizards poke out their tongues as far as possible distracting the birds with a flash of bright blue and ultra violet tongues. And yes, you would see the bright tongue under disco lights. “Blue tongue lizards have a highly conspicuous tongue, but unlike many other kinds of lizards, it’s a big tongue—the surface area is large. When blue tongues do a ‘full tongue’ display, the mouth is opened widely, and the tongue is flattened and expanded. At the same time, they may hiss and puff-up their body for maximum effect. This behaviour, in combination with a highly conspicuous tongue, can be quite intimidating for anyone that has got too close to a wild bluey,” said Associate Professor Whiting. The researchers, Associate Professor Whiting, Pau Carazo, a postdoctoral researcher at Macquarie (now at the University of Valencia) and Sam Price-Rees, placed blue tongues in a large-outdoor enclosure, where they held them briefly in order to test their behavioural responses to model, or fake, predators. The lizards were presented with a model snake, bird, fox, goanna (a large predatory monitor lizard), and a control element (a piece of wood). Full release from Macquarie at http://bit.ly/2y5YCGe.